H.M. Hoxie, third vice president of the Missouri Pacific Railroad, telegrams Kansas Governor John Martin. In this telegram, Hoxie asks Governor Martin to write a proclamation condemning the actions of Missouri Pacific Iron Mountain workers from other states who are attempting to intimidate Kansas workers through threats and destruction of railroad property. At the time of this telegram problems between the company and employees continued to mound. 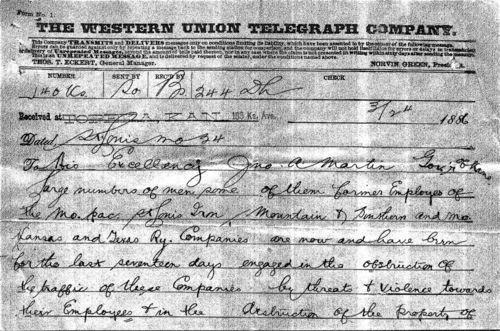 Although Governor Martin remained sympathetic to the workers, mob behaviors, such as those described in this telegram created an atmosphere that eventually forced him to take action.